COLUMBUS, Ohio Ohio State University President Gordon Gee announced his retirement Tuesday after he came under fire for jokingly referring to "those damn Catholics" at Notre Dame and poking fun at the academic quality of other schools. Ohio State initially called the remarks unacceptable and placed Gee on a "remediation plan" to change his behavior. Gee, 69, decided while on vacation that he would step down on July 1. "During my days away, I also spent some time in self-reflection," Gee said. "And after much deliberation, I have decided it is now time for me to turn over the reins of leadership to allow the seeds that we have planted to grow. It is also time for me to re-energize and refocus myself." At a Dec. 5 meeting, Gee said Notre Dame was never invited to join the Big Ten conference because "you just can't trust those damn Catholics." Gee also took shots at schools in the Southeastern Conference and the University of Louisville at a meeting with the school's Athletic Council. Gee apologized for the comments, saying they were "a poor attempt at humor and entirely inappropriate." Robert Schottenstein, who as chairman of the university's board of trustees condemned the remarks last week as "wholly unacceptable" and "not presidential in nature," said in a statement Tuesday that Gee informed him in the morning of his decision to retire. The university named provost Joseph Alutto as interim president. Ohio State trustees learned of Gee's latest remarks in January, met with him and created the remediation plan. In a March 11 letter, the trustees ordered him to begin apologizing to those he offended. Gee is downplaying the impact of joking remarks he made in his decision to leave, also citing his age, major upcoming planning changes at the university and his desire not to lose the university provost to another job. Ohio State trustee chairman Robert Schottenstein also said Gee's decision is not about a letter trustees sent him in March ordering him to watch his public remarks or about any dwindling support on the board. During his meeting with the Athletic Council, Gee said that the top goal of Big Ten presidents is to "make certain that we have institutions of like-minded academic integrity. So you won't see us adding Louisville." After laughter from the audience, Gee added that the Big Ten wouldn't add the University of Kentucky, either. Gee also came under fire a few years ago for some offhand remarks during a memorabilia-for-cash and tattoos scandal under football coach Jim Tressel's watch. Gee was asked in 2011 whether he had considered firing Tressel. He responded: "No, are you kidding? Let me just be very clear: I'm just hopeful the coach doesn't dismiss me." 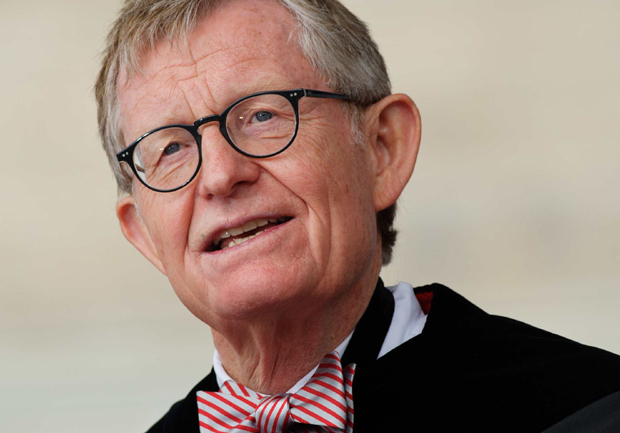 Gee was named the country's best college president in 2010 by Time magazine. He has held the top job at West Virginia University, the University of Colorado, Brown and Vanderbilt. He was Ohio State president from 1990 to 1997 and returned in 2007. He makes about $1.9 million a year in base pay, deferred and performance compensation and retirement benefits. He is a prolific fundraiser and is leading a $2.5 billion campaign at Ohio State, one of the nation's largest universities. He is omnipresent on campus, attending everything from faculty awards events to dormitory pizza parties. Ohio Gov. John Kasich on Tuesday praised Gee as "a tremendous partner in transforming Ohio's fragmented higher education system into one better focused on fueling Ohio's economic recovery and helping students meet their goals." "Clearly he leaves a rich and lasting legacy and will be missed," Schottenstein said.